Although their appearance is totally difference, birds and the group of crocodiles are closely related. Both of them lay hard eggs to reproduce and take care of newborn. They have similar lung structure with which they are able to live in low oxygen condition. Also the study of genomes shows that they have branched off from a common ancestor that lived around 250 million years ago. Dinosaurs also share this ancestor animal with them. Crocs have lived since dinosaur age and not changed their basic body structure since then. In a way they have very slowly evolved from their ancestor while dinosaurs have evolved into many types of dinosaurs such as Diplodocus, Triceratops, and Tyrannosaurs. On the other hand birds also have had long history of evolution since around 100 million years ago and have expanded their species especially after dinosaurs had disappeared around 65 million years ago. Birds have several characteristics such as feathers and beaks without teeth. They also lay hard-shell eggs and are able to breathe even in oxygen-poor atmosphere. Their bones have hollow inside and are very light but strong. The brain and eyes are well developed probably for foraging. Those traits are also found in some of the dinosaurs such as Theropoda. Many people think that birds are a group of dinosaurs because they share many common features other than flying. Theropod dinosaurs are especially similar to bird species. Both of them walk on two legs and have an advanced brain which is capable of learning. For instance Troodon is a theropod dinosaur which has a relatively large brain and the ability of depth perception with large eyes. Allosaurus is also one of the theropod and has hollow bones as birds have. That allowed them to move swiftly. During the age of dinosaurs the oxygen level in the air was low compare to present therefore dinosaurs had to have sufficient respiratory system to keep agility. Birds also have a special lung and hurt to fly at a high altitude or move large muscle. Liaoning province in northeastern China is one of the richest fossil sites in the world. The Yixian Formation, located in this province, yields so many fossils of plants and animal lived during the Late Mesozoic between 145 and 120 million years ago. The fossils include not only dinosaurs but also diverse of mammals, birds, reptiles, and insects. Then feathered dinosaurs have been discovered since 1995 from the layer of Yixian formation. The fossils of those dinosaurs are abundant and well preserved. Since animals' bodies had been covered by fine ash and mud, soft parts of them were not decayed by oxygen. Probably many lakes and volcanos were found in this region when dinosaurs were still roaming around. Some of them fell into those lakes after death and then their bodies were deposited in the natural container without oxygen at the bottom of the lakes. 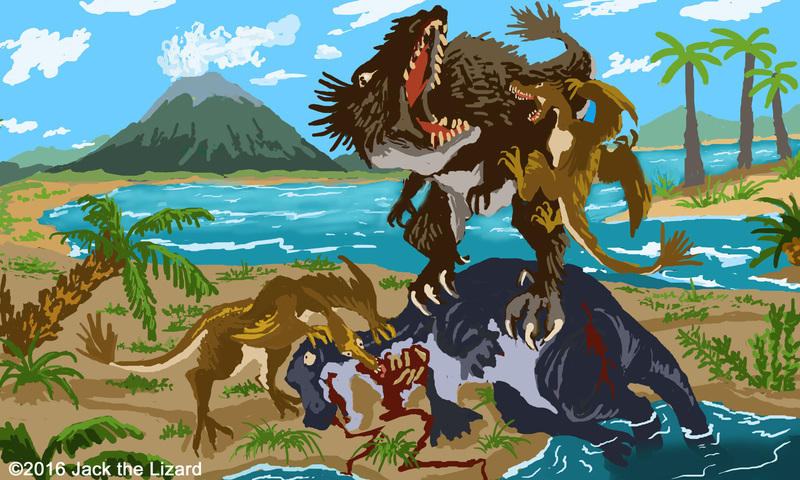 Yutyrannus probably had rivals that had also feather. Sinosauropteryx was discovered as the first dinosaur with primitive feathers in 1996. This theropod dinosaur lived during the Early Cretaceous around 120 million years ago. The size is approximately 1 m (3.5 ft) long and probably ate insects and small mammals. Much larger feathered dinosaur, called Yutyrannus, was also found in the segment of Yixian formation. Yutyrannus was, scientifically named in 2012, closely related to Tyrannosaurus and the size is about 9 m (30 ft) long. From tiny to huge many of theropod dinosaurs have been found so far. Sinornithosaurus was also found in the Liaoning province, shows the transition process from feathered dinosaur to birds. It has two types' feathers, one is for covering body and other is for forming wings. Then in 2014 several scientists reported that birds evolved from theropod dinosaurs. Dinosaurs slowly evolved into birds and gradually change their appearance from dinosaurs to present-day birds. Then they rapidly radiated to number of species at the end of the Cretaceous period. This means that they have survived the mass extinction and still exist today. If that was true, even though large toothed dinosaurs are all dead at least small dinosaurs would be still alive today. 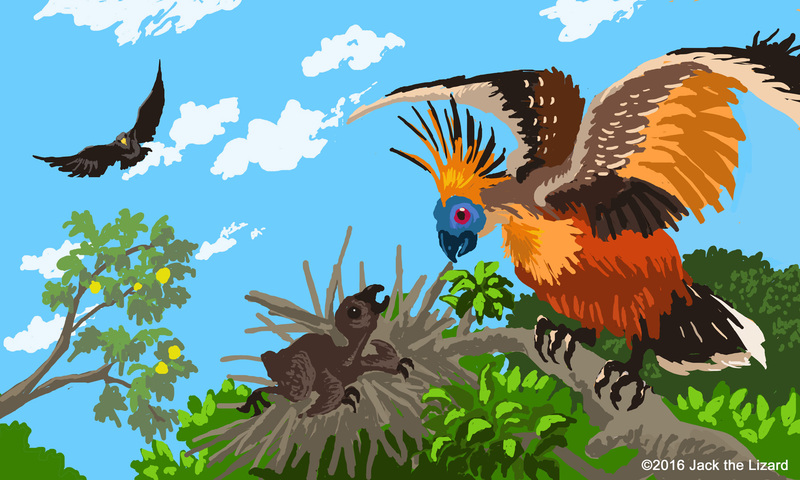 Hoatzin is one the only bird whose origin can be traced back to 64 million years ago. The diet of hoatzin is also unique because hoatzin eats mostly leaves, about 80% of its diet, flowers and fruits cover rest of portion. As cows do, hoatzin has bacteria which help digestion by breaking down plant matter in its stomach. Therefore hoatzin is a ruminant same as cattle and deer. Also hoatzin chicks have two claws on their hand and use them when they crawl up to the nest after falling down. Hoatzin's amazing survival skill avoids extinction for long period of time but now they are threatened by habitats loss. In fact many other wild birds are facing to extinction because of habitats loss and environmental degradation. This means only surviving species of dinosaurs will disappear forever if we do not think it over seriously. Sometime hoatzin chicks fall from the nest intentionally to avoid predator.